Gulped one of these down at the Freedom Festival in Provo, Ut over the Fourth. It had been tooooo long. I just love grape and lime together all at once. Make these one by one. Squeeze half of a lime in drinking glass. Scoop in a decent amount of ice. 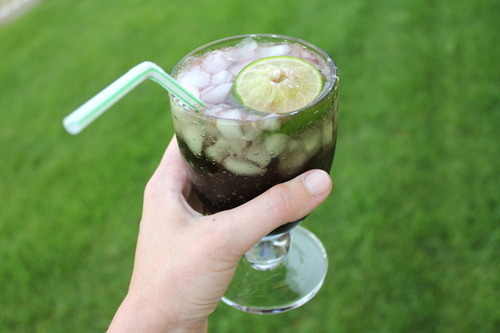 Pour in 1 cup club soda and 4 tablespoons grape syrup. Rest your squeezed lime halve on top of ice. Don’t forget to drop in the straw. Follow these same steps for filling remaining glasses. P.S. My husbands bowling name is Lime Rickey. He’s so cool. Post edit: Sorry if you already saw this over on our tumblr....we've been in the process of transferring over all our posts.